In my part of the world, nail art bloggers are almost rare. So when I knew about Rachael, a fellow nail artist here in the Philippines, I couldn't (really) wait to meet her. So came that fateful day that we had a girls night out in her hometown, Cebu City. Before our meeting, I was excited and scared at the same time even though we have chatted a few times already. But then the moment we finally met, I realized I just got scared for nothing. She was not only pretty, she was super friendly as well. We became friends almost instantly. It's so easy to open up to this wonderful person. I can't tell you how thrilled I am to be guest posting here on Rina's blog! My name is Rachael (also known as The Nailinator) and I am a nail art addict. When I first got into nail art a few years ago, I searched for other Philippine-based nail blogs and Simply Rins was the first one I ever found. I spent a long while oohing and aahing over Rina's designs, and I've been a big fan ever since. I've even had the pleasure of meeting her in person and I'm an even bigger fan now. She is such a sweet soul. She's got some amazing skills and creativity, and I'm honored that she asked me to share a little something with you all today! 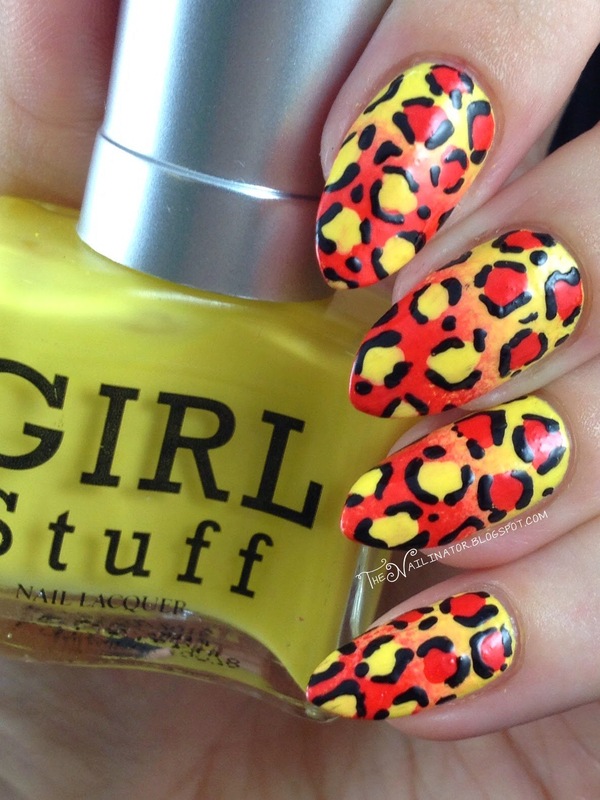 Would you like to know how you too can get these awesome reverse gradient leopard print nails? Start with a yellow base color. (I used Girlstuff Lemon Drops) Then sponge a gradient onto your nails using your yellow and a bright orange shade (My choice is O.P.I. My Paprika Is Hotter Than Yours). Bonus tip: I recommend using scotch tape around your cuticles so that after you are done sponging, the cleanup won't be so time consuming. After the sponging, use a medium sized dotting tool to make strange blobs (see above picture) on your nails, let that dry a bit, and then use a very small dotting tool and some black polish to add the black marks. 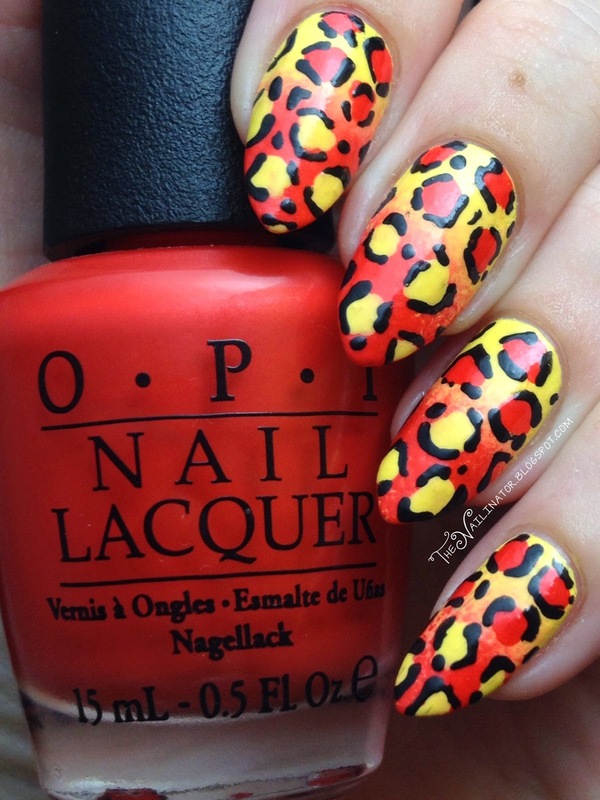 Pause for a moment and be amazed at how just a few black marks change these goofy blobs into awesome leopard print! It's the details, people! 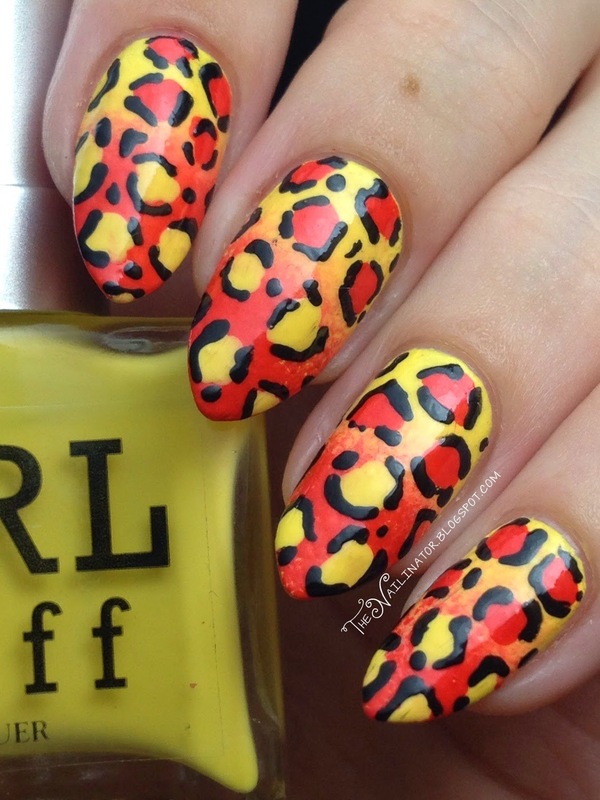 Finish off with some top coat, clean up around the edges and enjoy your flashy nails. This reverse gradient design looks great in any color. I did a teal version of these last year, and they looked amazing. That's all for now. Thank you, Rina for the invitation to drop in and say hello to your lovely readers, and thank you all so much for reading. I hope you enjoyed these and that they brightened your day. Eeeee, I feel so tickled to see my favorite local nail bloggers appear on each other's blogs! :D Yay Rins and Rachael! PS: Beautiful mani! 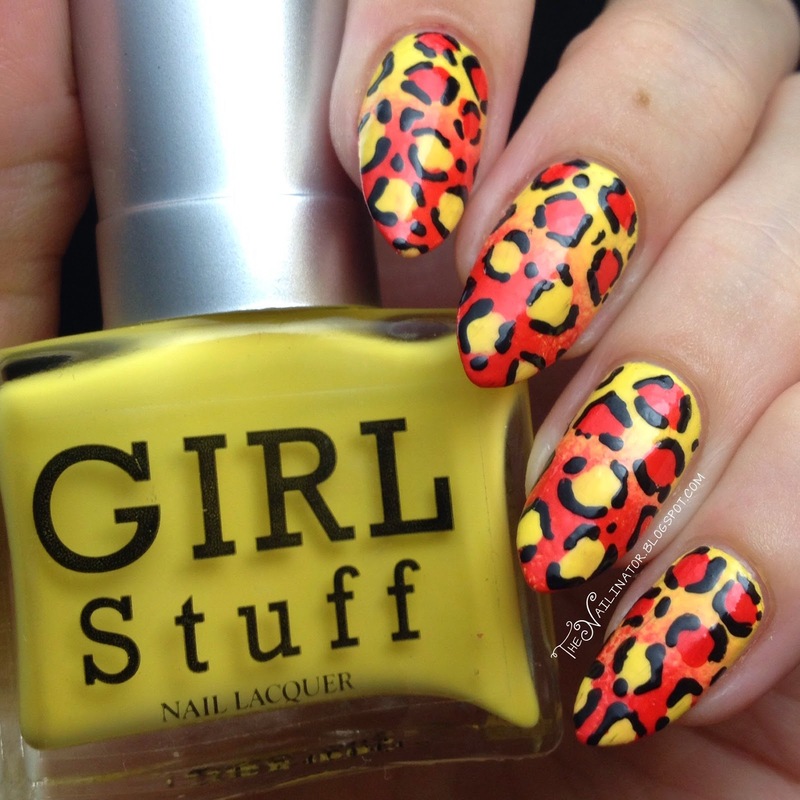 Nail art is the amazing thing one can do and can have attractive nails too. 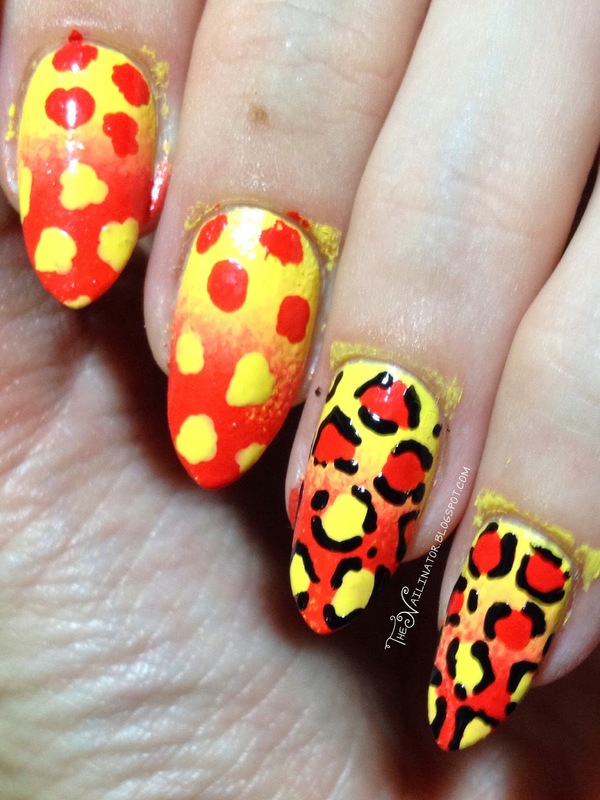 I loved your collection of nail art and the way you have done this creativity is amazing.